Selecting the correct blade for the material to be cut is important when setting up a hacksaw. High Speed Steel (HSS) blades are used for tough, resistant materials whilst High Carbon Steel blades are for general cutting. Selecting the correct number of teeth per inch (25mm) is also important. 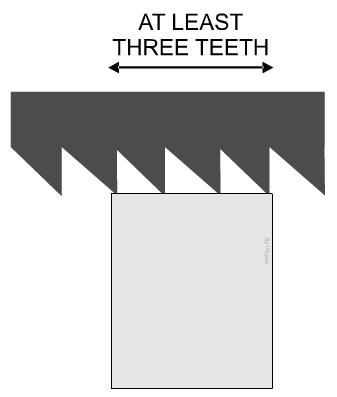 The general rule is that at least three teeth should extend across the surface of the material to be cut. The material should be carefully marked out. This normally involves using an engineers try square and scriber. One hand holds the hacksaw handle. Notice how the index finger is used to support the handle and also points in the direction of cutting. The other hand holds the frame, near the wing nut. Cutting/sawing should be carried out close to the jaws of the vice. This ensures that the metal does not flex or bend under the force of the hacksaw and the sawing motion. When the metal has been cut, it will need filing. This removes sharp ‘burrs’ so that the metal can be handled safely, without the possibility of cuts to the hands.